1. Open the spoiler in the previous post. 2. If it is text, then draw what is described to the best of your ability (MS Paint works just fine). Post the image under a spoiler. 3. If it is an image, then describe what is in the image using words. Post the description under a spoiler. Additional rule: No posting more than once within a span of six posts. The idea is to see how the scene evolves over time, just as in the children's game Telephone--the only difference is that instead of whispering words, we alternate between words and pictures. Randall Munroe realizing with horror that the velociraptors in his comics have come to life. A man cleans a dinosaur's hind with a towel. The dinosaur is approximately the height of the man, and only has two legs. Ph3aR m4 ep1c dr4W1ng sk1llz! 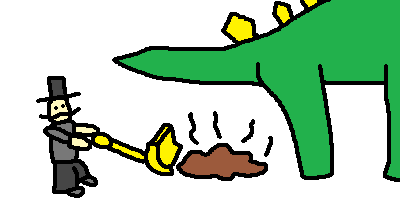 an angry man in a green shirt is angry about having to pick up his pet dinosaur's poop. Bald guy picking up dinosaur poop. Edit: just looked at other pictures after posting and now realize how bad my drawings are. I think i'll stick to the writing part in future. didn't whoever that is see JestingRabbit's big warning at the top of the other thread, not to post in other threads apart from that one? It's a man collecting the dinosaur's poop. A man digging out a stegosaurus that's stuck in mud. Go! Go! You can do it username5243! A man with a spoon scooping custard from a dinosaur. A very happy man with a thermometer measuring the temperature of a dinasaur's spit. nightlina wrote: Damn.. if there was a cannon ball thrown for every time someone was wrong on the internet.. well... I don't think we'd have enough cannon balls! There's a big green t-rex on the right with his mouth a-gape and saliva shooting out, forming a puddle on the ground. A scientist guy with messy hair and a lab coat is bending over and measuring the temperature of the puddle with a thermometer. He seems pretty happy about it. Somehow this thread has risen phoenix-like from the ashes and is enjoying a vigourous new lease of life. Last edited by Dr. Diaphanous on Sun Nov 18, 2012 7:04 pm UTC, edited 1 time in total. Last edited by SuperTD on Sun Nov 18, 2012 7:17 pm UTC, edited 1 time in total. A dinosaur is throwing up, and a man is dipping his kebab in it. A shadow monster is eating a fir tree while a man cuts it with a fire axe. I guess we shouldn't bother with the additional rule, right? A black ghost is levitating or about to catch a felled tree for a lumberjack, which was cut down in one swoop of an axe. The lumberjack has an oversized axe, and he is right handed, wearing a green shirt, blue trousers, hot-pink/purple shoes and short sandy hair. the ghost is to the right of the image and is about 3 times as tall as the lumberjack, has small white eyes and angry eyebrows. A man wearing bright clothes with a giant axe on the left. There is a dark evil ghost on the right. Behind them is an enormous chain of sausages, each sausage far bigger than the man. Next to a tower of sausages, a baby appears in front of an axe that was about to chop the Lavender Town ghost. Dr. Diaphanous wrote: Somehow this thread has risen phoenix-like from the ashes and is enjoying a vigourous new lease of life. 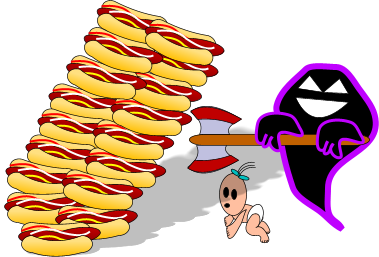 An unsteady tower of Polish sausages sits next to a purple and black maniacal ghost that is swinging an axe above a baby. A baby, dressed in a white diaper and a blue bow, is crawling and stares wide-eyed in the shadow of a large pile of large hot-dogs with identical condiments. Meanwhile, a black ghost outlined in purple wielding a giant ax and a Jack-o-lantern face floats poised to chop the innocent baby to pieces. The scene is very joyful. seems darvince and vieto posted at about the same time, both with text. Doesn't matter much because although mine illustrated vieto's, it doesn't do a bad job of illustrating darvince's too. An evil spirit with a hatchet and a baby with a bow (cupid?) were travelling down a muddy hill on a sunny day and came across a stack of hotdogs next to a huge black triangle. An archer and a snake with an axe are on a mountain on a sunny day. There is a black triangle with hot dogs on it.